As our team reflects on this past year, we are filled with flashes of the milestones we conquered together. We could not be more thrilled with the response of our V9 release. We’re so thankful to our loyal customers who made it happen and propelled us to this point. In the spirit of Thanksgiving, we thought we would venture back to the genesis of Pyware and the journey that has led us to over 35 years in the business and why Py and Cayleen Kolb (owners) are so thankful. What initially sparked your passion for marching band? Py: Well, it’s actually an unconventional story. I suffered from severe asthma as a child. The doctors told me it would be extremely beneficial to play a large brass instrument to try and strengthen my lungs. If it had not been for band, I probably would not have lived into my teens. Following the doctor’s recommendation, I became deeply involved in bands from elementary through college. Was there an “a-ha moment” that made you see the vision for Pyware? Cayleen: It was about 1981 and Py was promoting his pre-programmed shows at the Texas Music Educator’s Association Convention. He asked me to come help with the marketing and advertising. When I got there, I was blown away by the crowds coming to watch his presentation. As I was mingling, all the hype was more about his software that created his pre-programmed shows. As we were driving home, I convinced him to take that leap of faith and follow the music software path instead of the shows. And we went for it! Where was your initial office space? Cayleen: In Py’s dad’s barn, and we lived in an apartment complex with occasional visits from roaches. But we were determined we had a unique idea and had to make sacrifices to get it off the ground. As the founders of Pyware, what are you most thankful for within this company? Py & Cayleen: We are very blessed and extremely grateful to have the opportunity to grow a family business with the ones with love. We also have exceptional employees who work tirelessly to make sure our customers are nothing less but gratified. We believe our customers can attest to that. We continue to thank God for allowing us to run a business we love. 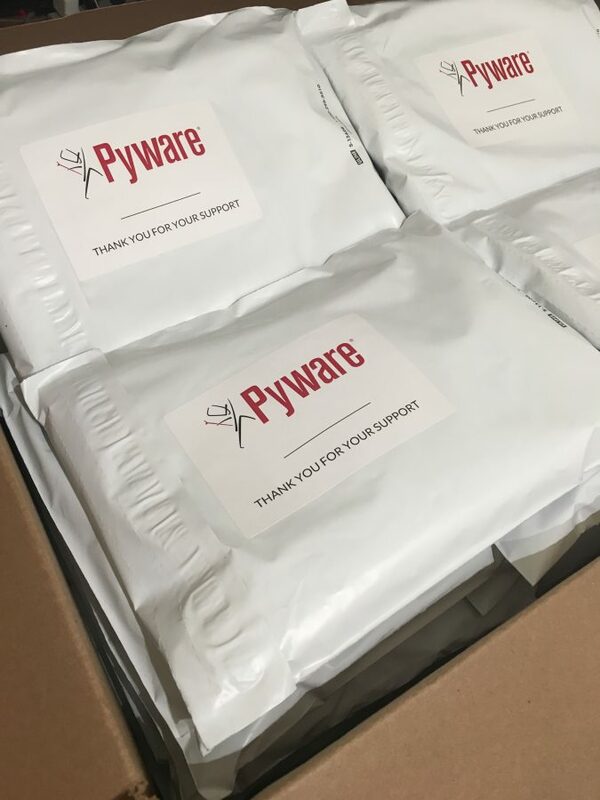 Our Pyware T-shirt campaign that we started in September is one of the many ways we wanted to extend our gratitude to our amazing customers. While we continue to explore fun ideas to give back, we want to wish you all a Happy Thanksgiving!